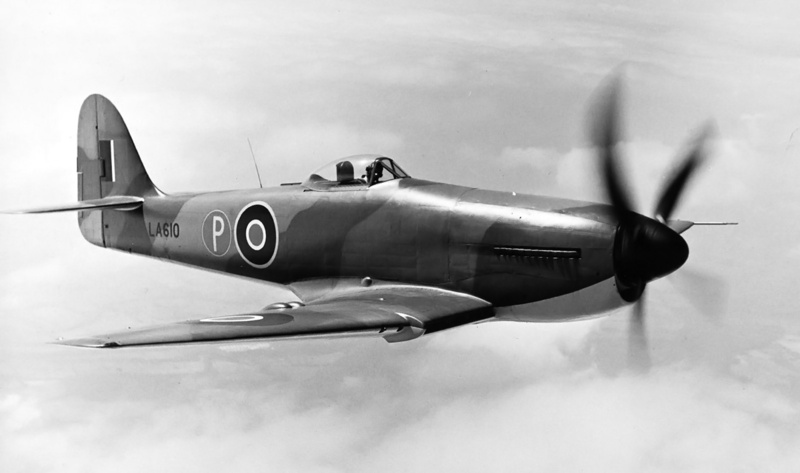 While testing of the Tempest prototypes was still underway in 1942, the Hawker design team began to study ways to improve and lighten the fighter aircraft. Some of their ideas were influenced by the study of a German Focke-Wulf Fw 190 A-3 that had inadvertently landed in Britain in June 1942. The Fw 190 proved smaller and lighter that its Hawker-built contemporaries. In September 1942, the British Air Ministry issued Specification F.6/42 calling for a new fighter aircraft. Hawker proposed three versions of its improved Tempest, each to be powered by a different engine: the V-12 Rolls-Royce Griffon, the 18-cylinder Bristol Centaurus radial, and the H-24 Napier Sabre. The Napier Sabre-powered Hawker Fury LA610 in-flight exhibiting exactly what a high-performance aircraft should look like. The Air Ministry supported Hawker’s designs under Specification F.2/43 issued in February 1943. In April 1943, Specification N.7/43 was issued for a new Navy fighter. Sydney Camm, Hawker’s chief designer, felt that arresting gear and folding wings could be added to the “improved Tempest” design to make it meet the requirements laid out in N.7/43. This plan was approved, and Specification N.22/43 was issued to Hawker for the new Navy fighter. Around this time, the two new Hawker aircraft received their official names: Fury (for the Royal Air Force’s land-based version) and Sea Fury (for the Fleet Air Arm’s naval version). From the beginning, the preferred power plants were the Napier Sabre for the Fury and the Bristol Centaurs for the Sea Fury. Although the detailed design drawings for the Sabre-powered Fury were finished first, developmental delays of the new Sabre VII (NS.93/SM) engine resulted in the Centaurus- and Griffon-powered Furys being completed first. The Centaurus-powered Fury (NX798) first flew on 1 September 1944 followed by the Griffon-powered Fury (LA610) on 27 November 1944. The Hawker Fury LA610 originally flew with a Griffon engine and contra-rotating propellers. The large duct under the spinner housed the radiator, similar to that used on the Tempest V and VI. Although the Air Ministry ordered 200 Sabre-powered Fury I aircraft in August 1944, there were rumors that Sabre production would be shut down following the war’s end. In October 1944, the Ministry of Aircraft Production (MAP) assured Hawker that Sabre production would continue. In November 1944, the MAP requested a Sabre-powered Fury prototype be built utilizing the Griffon-powered LA610 airframe. However, in February 1945 the Fury I order was reduced by 50 aircraft to 150. But in March 1945, two additional Sabre-powered prototypes (VP207 and VP213) were requested. Work to install a Sabre engine in LA610 began in July 1945. With the war over and the future of fighting aircraft pointing toward jet power, orders for the Fury I were reduced again in September 1945 to 120 units. In December 1945, the Air Ministry had informed Hawker that ground attack would be the Fury I’s primary role. Hawker felt the aircraft was not suited for this because of its liquid-cooled engine, and it did not have the armor needed for a ground attacker. As a result, in February 1946, the number of Furys on order was further reduced to 60—and even those were in jeopardy. During this time, modifications of the LA610 airframe had been completed, but the Sabre VII engine was not ready. Rather than wait for the engine, a Sabre VA (2,600 hp / 1,939 kW) was substituted. Soon, a Sabre VII was installed, and Fury LA610 was flown for the first time with its intended power plant on 3 April 1946. 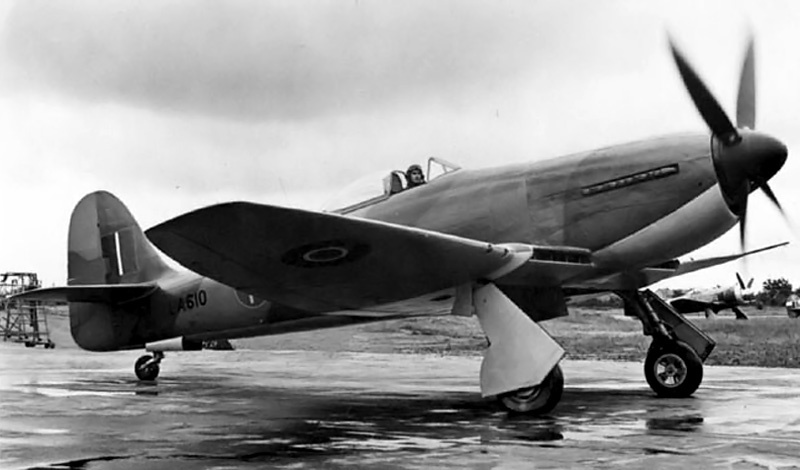 The Hawker Tempest I (HM599), with its close-fitting cowl and wing radiators, was a stepping stone to the Fury I. While the rest of the aircraft remained the same as the other prototypes, the power section of LA610 was completely different. A streamlined cowling was installed to cover the liquid-cooled Sabre engine. Coolant radiators were installed in the inboard wing sections, replacing additional fuel tanks. Cooling air would enter the wing’s leading edge, pass through the radiators, and exit via shutters under the wing. This configuration was similar to that used on the sole Tempest I prototype (HM599)—production did not occur because the Air Ministry perceived the wing radiators as too vulnerable to combat damage. The radiator shutters of the Fury I were automatically controlled based on engine temperature. A split duct under the spinner supplied intake air to the engine via the duct’s upper section. Air from the lower duct was directed through engine oil coolers and then out the bottom of the cowling. 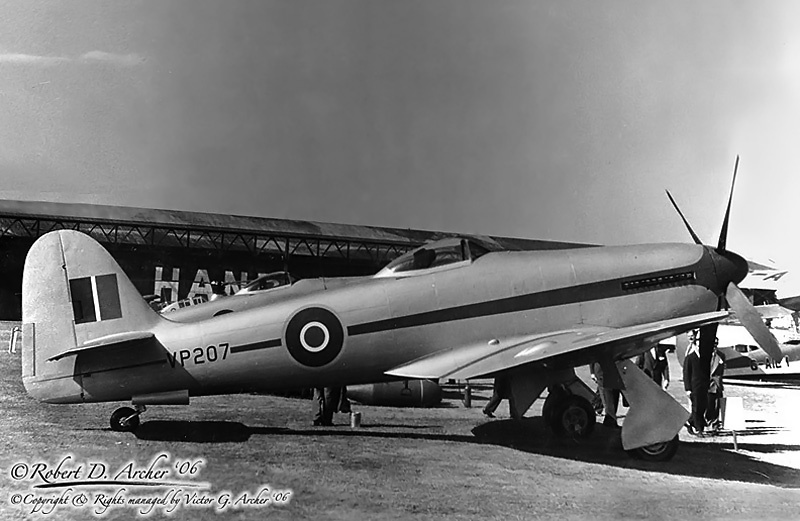 Not only was it one of the most beautiful aircraft ever built, the Sabre-powered Fury proved to be the highest performance piston-engine aircraft built by Hawker. The 24-cylinder Napier Sabre engine was a horizontal H layout with two crankshafts. The engine had a 5.0 in (127 mm) bore, 4.75 in (121 mm) stroke, and displaced 2,238 cu in (36.7 L). The Sabre VII utilized water/methanol injection to boost power and was capable of 3,055 hp (2,278 kW). To transfer this power to thrust, the Fury I used a 13 ft 3 in (4.0 m) four-blade Rotol propeller. 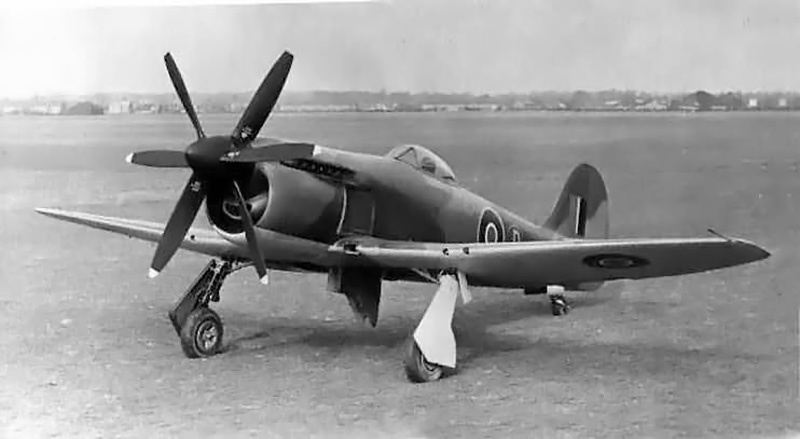 A five-blade propeller like the Sea Fury’s 12 ft 9 in (3.9 m) Rotol unit was considered, but the decreased weight of the four-blade unit proved decisive in its adoption. This rear view of the LA610 Fury shows how well the 3,055 hp (2,278 kW) Sabre-engine was fitted to the airframe, enabling the aircraft to exceed 480 mph (775 km/h). Note the large 13 ft 3 in (4.0 m) four-blade propeller. The Sabre-powered Fury had a top speed of 483 mph (777 km/h) at 18,500 ft (5,639 m) and 422 mph (679 km/h) at sea level. In contrast, the 2,560 hp (1,909 kw) Centaurus-powered Sea Fury had a top speed 460 mph (740 km/h) at 18,000 ft (5,487 m) and 380 mph (612 km/h) at sea level. The Sabre Fury’s initial rate of climb was 5,480 ft/min (27.8 m/s), and it could reach 20,000 ft (6,096 m) in 4.1 minutes. By comparison, The Sea Fury’s initial rate of climb was 4,320 ft/min (21.9 m/s), and it took 5.7 minutes to reach 20,000 ft (6,096 m). The Fury I’s service ceiling was 41,500 ft (12,649 m). All Fury and Sea Fury aircraft had the same 38 ft 5 in (11.7 m) wingspan. 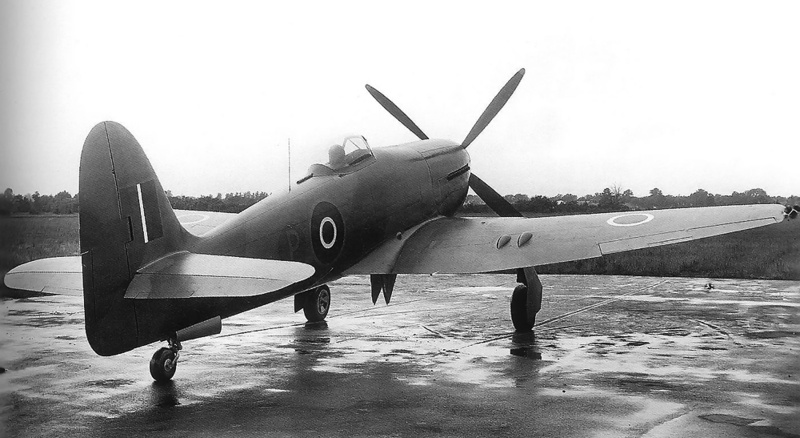 At 34 ft 8 in (10.6 m), the Sabre-powered Fury was 1 in (25.4 mm) longer than the Sea Fury. The Fury I had an empty weight of 9,350 lb (4,241 kg) and a loaded weight of 12,120 lb (5,498 kg). On 14 August 1946, the remaining Fury I aircraft on order were cancelled. Of the three Fury I prototypes, LA610 would remain with Hawker for testing, VP207 would be completed and loaned to Napier for engine testing, and VP213 would be used for parts and not completed. VP207 was chosen to go to Napier because it had a larger radiator that could handle developmental power increases of the Sabre VII engine. With the cancellation of the Fury I there was no longer a need for the Sabre VII engine, and its development was stopped; Napier would not take over VP207. VP207 was completed by Hawker and first flew on 9 May 1947. Hawker retained the aircraft as a company demonstrator for a period of time. The final disposition of LA610 has not been definitively found, but it is believed that the aircraft was scrapped in the late 1940s. VP207 was stored and maintained in Hawker’s facility at Langley Airfield until the mid-1950s, when the aircraft was scrapped. Fury LA610 preparing for a flight. The air scoop under the spinner, and the wing radiators can clearly be seen in this image. Although the Fury never progressed beyond the prototype phase, the Sea Fury did enter production, with some 789 aircraft built (number varies by source)—including prototypes and 61 two-seat T.20 trainers. Sea Furys served in Korea, were the last front-line piston-engine aircraft operated by the Royal Navy Fleet Air Arm, and were sold to and used by various other countries. A number still fly today, but due to the rarity of the Bristol Centaurus engine, many have been re-engined with Wright R-3350s. In addition, two Sea Furys have been built up for racing with Pratt & Whitney R-4360 engines, and one has a Pratt & Whitney R-2800. But none have looked quite as stunning or performed as well (in military trim) as the Napier Sabre-powered Hawker Fury I. This entry was posted in Aircraft, Post World War II on 14 October 2014 by William Pearce. Thanks for that well illustrated write up Bill. & that it had been fitted with the final Sabre VII rated at 3500hp for take off at +20lb boost. even after they’d operated the Tempest as a target tug right up to the mid 1950s. Maybe – some day – Kermit Weeks will get his Sabre-Tempest flying again..
I’m glad you liked the article. 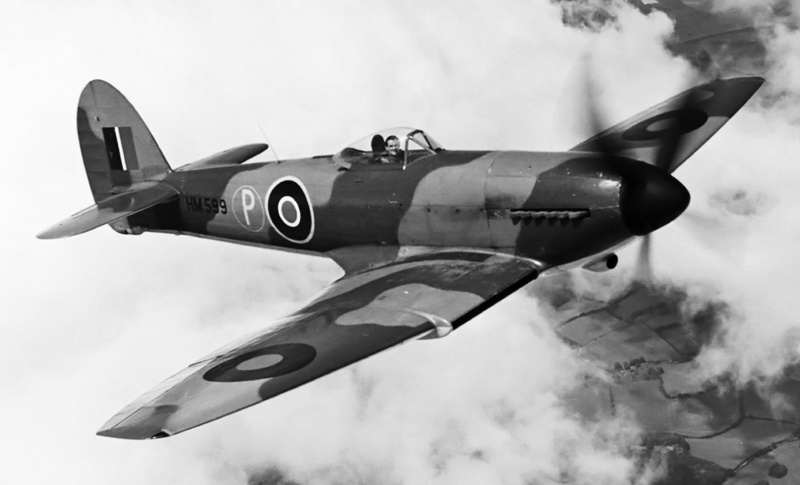 I have heard the Sea Fury was/is quite the beast, so it only makes sense that the Sabre-Fury would be even better. It is a real shame that one was not preserved and even more of a shame that no running Sabres exist in anything. Kermit Weeks has two engines that he is trying to make one runner out of for his Tempest V. It looks like a very long-term project, but I too hope it takes to the air someday so we can all hear that Sabre sing (and of course, see a Tempest V fly).